To spread great ideas on how to accept, appreciate and really love yourself because I know that being confident is the key to being happier, more successful and having a fulfilling and meaningful life. Diary of an Ugly Sweater is a uniquely sweet story of the struggles of Sophie, a sweater who learns she was created to be ugly. As Sophie navigates the world of challenging personalities while dealing with her own insecurities, she comes to find resources within herself and her friendships that allow her to gain the self-confidence she needs and most importantly, to love herself. Delight yourself with Sophie’s story while absorbing the insights she has gained. Perfect for the young adult you love. Let them enjoy a heart warming story while gaining the confidence that is crucial at this time in their lives. Sophie has enough going on as she learns to navigate the world around her and deal with other sweaters, humans, birds, elves, raccoons and even a big Santa head. When she finds out that she has been labeled an “Ugly Sweater”, her world crashes down around her. With the support of the mismatched family she has adopted in her new forever home, Sophie learns many valuable lessons, most importantly, to love herself. Experience the heart and life of Sophie, as she shares her deepest feelings to her very best friend, her Diary. Be delighted as you take this joyous journey into a fanciful tale that is destined to become a classic for all seasons and all ages. 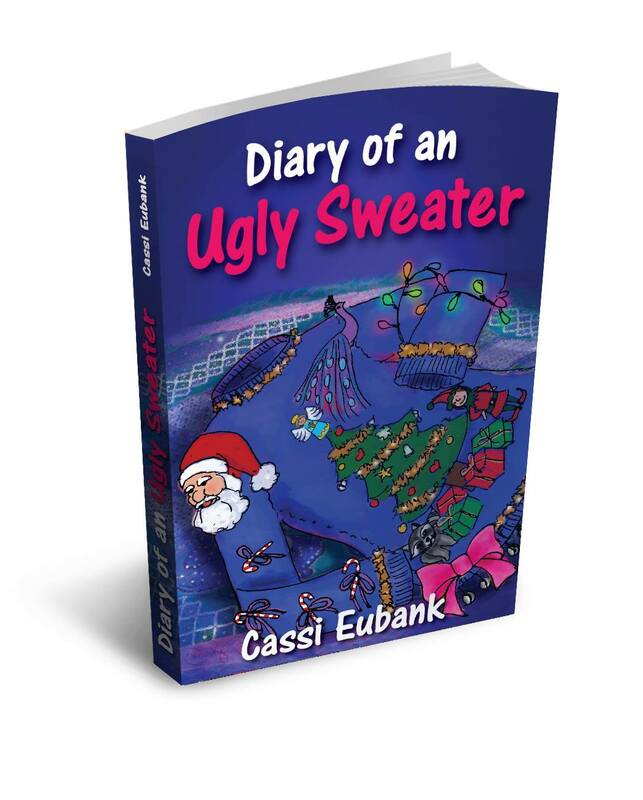 Based on a Christmas theme, the story tells of the journey of ‘Sophie’ the sweater who soon discovers she is an ‘Ugly Sweater’. Written as a diary throughout the month of December, Sophie realizes many life lessons through various characters that are both cute and profoundly wise. The characters hold the attention of both children and adults and the daily diary entries allow for a possible daily chapter reading to create a tradition of discovery and storytelling throughout the holiday season. As parent and child read each chapter together, they can discuss Sophie’s challenges, making it easier for kids to discuss their own issues. Readers may be reminded of “The Elf on The Shelf” written by Carol Aebersold and Chanda Bell. The multi-million dollar success has not gone without criticisms of materialism and privacy persuasions. Eubank’s work differs as the narrative directs a tighter hold to values of building self-esteem and discovery. This links closer to the feel of “Miracle on 34th Street” with subtle reminders of the importance of family and togetherness. Much to the delight of children, parents and teachers the story is not only entertaining but has substance and numerous openings for discussion and exploration of self-growth. Eubank’s work provides a new tool with the potential to create a fun and heartwarming family tradition that allows parents to teach their children what schools currently do not; dealing with relationships and our own insecurities. Further, despite the book being centered on Christmas traditions specifically, there are also teasers of other traditions that are subtle enough to explore and celebrate the diversity of cultures and all holiday celebrations. Eubank states, “This is not like anything I have published before. My intention with Sophie’s story, was to have a simple book to help teach self-esteem building and life skills to high risk children”. The author also plans to have a working guide in the near future to aid further in allowing readers to apply the lessons Sophie has learned in their own lives and create solutions to the universal problems that all people must navigate through in life. By having solutions in place before situations occur, people are empowered to act in a productive way and become the confident leaders our society needs.